A largely aquatic, somewhat variable bulbous perennial with numerous long, narrow, curved leaves, and scapes, to 60cm long, bearing umbels up to 12, fragrant white, purplish-red and pink flowers, to 12cm long, in summer. [RHSD, Hortus, Baker Am.]. A variable species attested by the large number of synonyms. 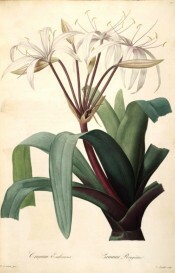 First botanically described as Crinum erebescens by Aiton in 1789 [Hort. Kew. vol.1, p.413/1789] following a manuscript description by the younger Linnaeus. ‘By Linnaeus, if he really meant the same plant, this was thought to be a variety of Crinum americanum given above, No. 1034; by his son it has been separated into a distinct species, and so continued from his manuscript in the Hortus Kewensis. But we doubt if Linnaeus had this plant in view. A native of Spanish America. Requires to be kept in the hothouse. Differs chiefly from americanum in the colour of the bloom and the cartilaginous toothed edging of the leaves. Our drawing was made from a plant in the collection, of Messrs. Whitley and Brame of Old-Brompton. Blooms at various seasons.’ [BM t.1232/1809]. ‘A native of the warm latitudes of America, and a very elegant plant. The specimen from which our drawing was made was a remarkably fine one, measuring above four feet in height. We are in possession of two or three varieties of it: the present is perhaps the most beautiful. It has long been an inhabitant of our stoves, and flowers generally in the autumn; is of easy culture, and requires however a pretty good heat.’ [LBC no.31, 1817]. Crinum cruentum is figured in the Botanical Register: ‘We did not expect so soon the appearance of one of the same genus, that should vie with the magnificent amabile, introduced two or three years ago by Sir. Abraham Hume. But in beauty of the corolla the present is at least equal to that, if it yields the points of fragrance and copiousness of bloom.’ The plant figured has bright pink flowers. [BR f.171/1817]. Crinum cruentum is now generally regarded as synonymous with Crinum erubescens although the latter is usually recorded as a native of the tropical Indies rather than the Americas. ‘This [Crinum cruentum] is a very handsome species when in flower; the whole plant is about three feet in height: our representation of the blossoms Is about one-third of the natural size. [The flowers] possess a slight and very delicate fragrance, and are produced at different seasons of the year, but chiefly in autumn. The leaves are furnished with a great number of longitudinal veins, which are crossed by short transverse ones, so that on being held up to the light, they look like net-work. Being a native of India, this plant requires to be kept continually in the stove. It should be planted in sandy loam, and may be increased by offsets, which occasionally spring up from the bulb. According to late importations from India, this genus appears to be much more numerous than was formerly supposed: it consists in general of very splendid plants, all of which are from tropical regions.’ [LBC no.346/1819]. Mrs Bury reported that Herbert imported Crinum cruentum from the East Indies [Bury t.22/1831]. I have no explanation for this discrepancy. Paxton's Dictionary lists nine varieties, introduced to Britain between 1789 and 1823. Redouté L pl.27/1802-1815. Listed in all published catalogues [B.82/1843]. Crinum attenuatum Willd. ex Schult. & Schult.f. Crinum corantinum Herb. ex Steud. Crinum lanceanum Willd. ex M.Roem. Crinum octoflorum Herb. ex Steud. Crinum rubrilimbum Sweet ex Steud.